Lumina News File photo. Congregations from Little Chapel on the Boardwalk Presbyterian Church, Wrightsville United Methodist Church, Wrightsville Beach Baptist Church, St. Therese’s Catholic Church and Pilgrim’s Rest Baptist Church gather for a sunrise service Easter Sunday, April 5, 2014 at 6:30 a.m. on the beach strand at the end of East Oxford Street, Public Beach Access No. 19. 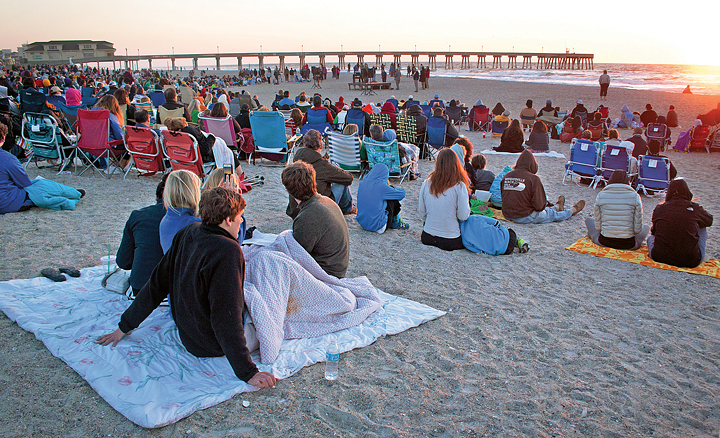 There are several chances to celebrate Easter on Wrightsville Beach this weekend, with services scheduled in a handful of locations on Sunday, April 1. More than 1,000 people are expected to come to the Wrightsville Beach Community Sunrise Service, with six local churches participating in the ceremony that begins at 6:30 a.m. at the Oxford Street beach access, Access No. 19. The Rev. Christina Turner of Wrightsville United Methodist Church will be delivering the sermon. Little Chapel on the Boardwalk, Pilgrim Rest Missionary Baptist Church, St. Andrew’s On-the-Sound Episcopal Church, St. Therese Catholic Church and Wrightsville Beach Baptist Church, with ministers from each church participating in some part of the ceremony. After the ceremony, Little Chapel on the Boardwalk, located nearby at the corner of North Lumina Avenue and Fayetteville Street, will host coffee and donuts. Wrightsville Beach Baptist Church will also host an Easter Egg hunt at Wrightsville Beach Park on Saturday, March 31 at 10 a.m.